At the Nanny Joynt, we get many common questions from both nannies and clients. So, from time to time, we like to take a closer look at a Frequently Asked Question here on the blog. We often get asked whether or not it is ok for families to bank hours and use them at a later date. Banking hours is so frequently asked about that we thought we would take a closer look at the topic. What would seem like a fairly straightforward compromise might be that, for example, if you leave on vacation for a week and do not take your nanny, you can ask your nanny to make up those hours at a later date since you have to pay her either way. Banking those hours you did not use is not only not allowed, it is illegal. Why Can’t Clients Bank Nanny Hours If They Go Unused? Because it was not the nanny’s choice to miss work, she should not be responsible for making up the hours at a later date. 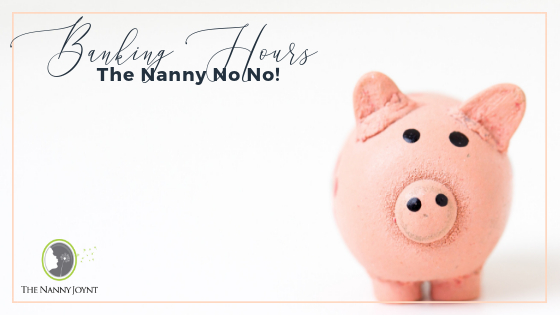 What often happens with banking hours is that the nanny ends up having to work late, weekends, or other hours which are outside her normal schedule that she agreed to. This infringes on her time off, which is unfair and can create unhealthy boundaries within the relationship. While it may seem like a fair agreement to bank hours, it can ultimately take a toll on the relationship between the nanny and the family – something nobody wants. Can Nannies Be Asked to Do Other Tasks While the Family is Gone? A family can choose to ask the nanny if they would be willing to do other things during those hours that their regular service will not be needed. Families can ask the nanny to pick up the mail, child related cleaning/projects around the house, pet sitting, house sitting. And, if the nanny agrees to this, that is perfectly fine. But, it is up to the nanny and the nanny is not required under her contract to agree to doing anything outside her job description. It is important to keep the additional duties within her normal scope of work. Ultimately, it is important to consider not just what is fair for the family or fair for the nanny, but what is fair for everyone without jeopardizing the relationship between the family and the nanny, which is why The Nanny Joint does not allow clients to bank nanny hours.